“We’ve reported measurements of two clocks that in principle exceed our ability to account for [this effect] across the surface of the Earth,” Andrew Ludlow, physicist at the National Institute of Standards and Technology in Boulder, Colorado, told Gizmodo. Clocks are merely tools that measure how time passes by counting a repeating thing, be it a swinging pendulum or a vibrating atom. Optical lattice clocks, like the ones used in this study, work the same way—but not quite so simply. Scientists first use lasers to set up an atom-trapping field, shaped like a row of cups. Thousands of ytterbium atoms populate the cups. 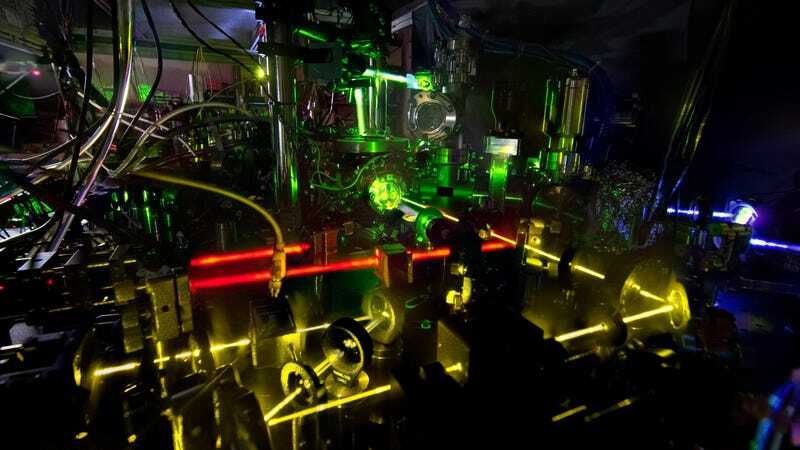 If struck with a laser of exactly the right frequency, the electrons will jump between two energy levels, an incredibly large (nearly a quadrillion) but exact number of times per second. Once the laser is tuned to the perfect frequency to begin this oscillation, it passes to another component, called an optical frequency comb. This essentially serves as the gears of the clock, translating the information carried in the laser light’s frequency into a signal that can be used in electronics to create the tick. Here, the researchers have essentially characterized the frequency to such a high precision that they can use it to precisely measure how gravity affects time, according to the paper published in Nature. A pair of ytterbium optical clocks accurately reported the ytterbium’s transition frequency within 10-18 of the actual frequency, varying at most by 3.2 x 10-19, with a difference the two clocks’ reported frequencies at around 10-19. Clocks with these accuracies would take longer than the age of the universe (13.8 billion years) to lose a second. But characterizing the clocks this well meant that the ytterbium clocks could detect how Earth’s gravity had slowed time, accurately determining their location in the Earth’s gravitational field to within a centimeter. This is better than the state-of-the-art Earth-measuring systems. Ludlow explained that the team hasn’t compared the clocks in two separate locations, yet. A test like that would reveal the higher-altitude clock ticking faster, since the pull of Earth’s gravity on an object actually decreases slightly as the object moves higher in altitude. But physicists have ideas for how to use them, especially when it comes to hunting for dark matter—stuff that our eyes and telescopes can’t directly see, but which seems to exert some force of gravity throughout the universe. Perhaps these clocks could detect dark matter from the way its gravity alters spacetime. Maybe they can even detect ripples in spacetime called gravitational waves. Or maybe it’s time to move atomic clocks into space, where they’re less affected by local differences in the Earth’s gravity. It’s hard to say. No, you can’t wear this clock on your wrist or hang it on your wall—it’s still a setup built on a lab table. But if you could, it would be pretty sick to be able to tell your friends that you were late because their local gravitational potential was too high.